LOS ANGELES, CA, UNITED STATES, October 8, 2018 /EINPresswire.com/ — Acclaimed author of Authenticity, Accountability & Ambitions: Speaking the Truth Through a Black Woman's Eyes (AAA), and Civil Rights activist, Kimlin Charise Johnson, supports Nike’s controversial “Just Do It” campaign featuring famed footballer Colin Kaepernick. 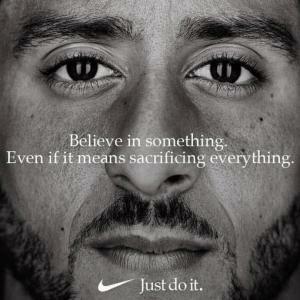 The Nike ads feature the quarterback who started a movement among NFL players by kneeling during the National Anthem in protest police brutality and racial injustice. The message was heard loud and clear amongst Nike’s core customers— Millennials and younger men, which represent two-thirds of the company’s customers. Consumers seem to agree, as many people are in support of Nike's decision to use Kaepernick. Not to mention the fact that Nike gained 170,000 Instagram followers, and that an Instagram post featuring Kaepernick was the second-most liked post in Nike's history, behind a post about the World Cup. Experts say that the campaign has increased core customers' loyalty to Nike and has raised awareness for the brand.